Published as a part of the exhibition 'Book, A Room' at Witte Zaal, Gent. 22 January-6 March 2010. 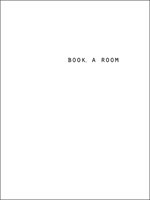 A publication, an installation and a studio, all three form a part of 'Book, A Room', a project as a result of a research conducted by Frank Depoorter and Lore Rabaut since early 2009. The subject of the research is the objective and the subjective perception of one (exhibition) space, a place where art is displayed, where meetings take place... 'Book, A Room' is it not the end but rather a state of affairs or cross-section of a 'layered' and multifaceted research.